Murphy’s Law, but not quite. Gideon and I were headed to our Thursday morning Mommy Bible Study. We were not running late, I was enjoying the beautiful downhill road to the river. It’s uncanny how this picture resembles the curb where I spun out this morning. All of a sudden, I started to skid a little. I took my foot off the pedals, and held the steering wheel still to try to regain control. That did not work, and a little bit of skidding turned into heading downhill completely sideways. I ever so gently tapped my breaks to try to slow down, and that’s when physics took the wheel completely. Physics was always my worst subject, worse than chemistry. To this day I don’t know how I passed my physics classes and after today, I’m further from understanding it then ever before. We were headed towards the ledge, and I screamed. I screamed because I’ve had dreams of losing control of the wheel. I screamed because the possibility of my car flying after falling off a ledge is non-existent outside of the land of dreams. I screamed because I had precious cargo in the back seat, and no way to remove him from the situation before the inevitable. We hit the guard rail head on and I could see the creek below. There was a stone draining wall 10 feet down, and I did not want to land on it. Somehow that guard rail held the weight of my car, and more physics action took place to make my car spin one last time. My car finally came to a full stop. It was leaning up against the guard rail, facing opposing traffic directly on a downhill blind curve. Thank goodness there had not been any cars around for me to run into while spinning around uncontrollably. I took in the fact that the action was over, and looked in the rear view mirror. Gideon was sitting in his car seat just looking around like “what just happened??”. I asked him if he was ok, and he said “uh huh”. I wanted to climb into the back seat and check on him, but I didn’t know how stable the car was, or how close we were to the edge. I was scared to move. I couldn’t get my door open, and just sat confused for a few seconds. I didn’t realize how distraught I was until I reached for the diaper bag. I could barely hold anything because I was shaking so badly. The diaper bag contents had fallen all over the place, and of course my phone was the one thing I could not readily find. I called Daniel who was home and two minutes away from me. He said he would call the police. I very slowly climbed out of the car through the front passenger door. A sweet lady named Julie pulled over and kept me company while I waited for Daniel to arrive. Bless little Gideon, he was completely unaffected by the whole thing and was pointing out all the trees, and chatting it up with his new friend. What seemed like hours later, I was sitting in Daniel’s truck with Gideon. He could hear me crying and knew how upset I was. All of a sudden he says so sweetly from the back seat. He’s barely two years old, and he’s already comforting and reassuring his mother. Who is this child?? How did I ever get to be the mother of such a tender hearted little boy?? The sweet lady officer was really thoughtful, and told me before leaving “someone was watching out for you.” And of course a whole other level of weeping ensued. I’ve been weepy all day, and I only started feeling better after Gideon and I took two and a half hour naps. When we woke up we spent some time enjoying the beautiful weather on the front porch, and the rest of the evening was enjoyable. It sounds like the car is totaled. We just put new brakes on it a few weeks ago. Murphy’s law? To a degree. But Gideon is safe, and I’m safe. Murphy’s got nothing on God. Photo and Video Update. Long Overdue. If I put off blogging another day I’m going to start forgetting things that I want to keep filed away for the years to come. I don’t know what has kept me from blogging the last few weeks, but I want to be back. If I’m not careful, I tend to get so focused on being a mother, wife, and homemaker, that I forget that I’m also my own person. A person who has hobbies (if she’d make the time for them), and interests outside of homemaking. Daniel is openly supportive when he finds me immersed in diversions. He fell in love with a girl who enjoyed a wide variety of leisure activities. And although we both know priorities change as life changes, nothing brings us back to the essence of our love for each other more than seeing the other person enjoying some distractions. I want to be intentional about keeping the flame alive, and make sure Daniel knows that the girl he fell in love with is still here. Plus, it’s good for Gideon to see me have fun with my hobbies. The older he gets the more involved he wants to be. Far be it from me to keep him from experiencing and learning different skills and expanding his imagination. The way he’s headed, he will be a jack of all trades! The arrival of spring, and the appearance of the celestial body people call “the sun”, has really sparked a new energy in Daniel and myself. He has gotten to work on revamping his wood workshop and tree planting. I’ve taken a liking to sewing (more on that in later blogs) and a newfound love for my lost friend: Canon T2i. I have a photo session set for this weekend, and I am psyched about it. I also have a lot of baking to do for a baby shower this coming Sunday, and I’m pretty happy about that too. We have a running list of projects for this coming spring and summer, and we are raring to go! Without further ado, here goes a photo and video update of my sweet little boy. I continue to find him completely scrumptious and irresistible, and as long as he allows it I will continue to eat him with kisses. For my birthday the boys gave me a new bird feeder, and an indoor tree for the foyer. 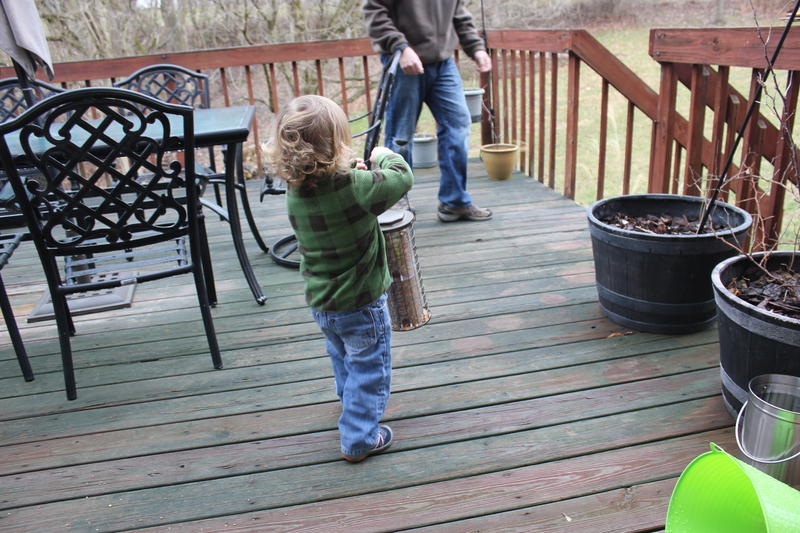 Here is Gideon helping fill the bird feeder, and then carrying it to the shepherd’s hook. We love looking at all the birds. Our favorites are the Chickadee and Tufted Titmouse. Gideon insists that female cardinals are chickens. A week later Daniel took me on a movie and dinner date. “Insurgent” and the best pad thai since that place in NYC in 2009 were on the docket. He’s always been the best date planner since the beginning. Here is corporal Daniel studying for the sergeant’s test. The picture of multi-tasking. Obsessed with his chubby legs and little feet. Normal, right? Gideon and his cousins love each other so much. It’s adorable to watch them interact. He’s a lucky boy! The boys getting dirty and working hard! The Easter Bunny had a lot of fun shopping this year! Dollar Tree and Target Dollar Spot! Jackpot! This year’s Easter basket contents included: A Fubbles wand, a Thomas the Train plate, window markers, paint brushes, frog jump rope, toy airplane, his first tumbler, a poppy plant, and three easter eggs containing Annie’s organic gummy bunnies, chocolate covered almonds, and animal stickers. The table runner shown is my latest little treasure. Courtesy of my in-laws, who bought it for me from a little shop in the Amalfi Coast of Italy. A birthday gift from their 3rd annual European adventure. There are strict no food or drink rules around this beautiful piece. Easter Egg Hunt of 2015! He is old enough to understand the concept and had so much fun!! The first of many pictures of Gideon covered in dirt and mud. I love it! Finally, here are some random snippets taken with my iPod. Apologies for the poor quality. I don’t quite have the time to edit my “real video” taken with the T2i.